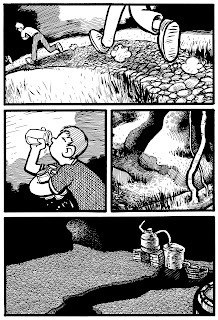 gobnobble -- the comic work of David Allan Duncan: More Moonshine Stuff. The week before Comic-Con, I decided that I didn't like how Rob's shirt was looking. I thought that I'd try using zip tone instead of hatching. Then I thought I'd try using it on all the characters. Well I spent two days going through and changing the textures on the boys. I thought that it looked alright - and I still think it looks okay on screen. When I printed them out, however, I think it looked like crud. All that time wasted. Ugh. 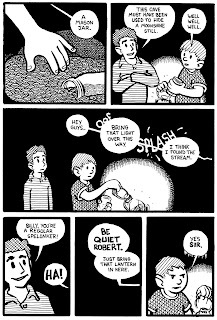 So I decided to go back to the original hand-drawn hatching and just change Rob's shirt (seen below). Here are a few more random pages.